This game is 6� wide by 12�long and 4�tall. While goalies guard their territory on the ends, other players use air hoses extending from the sides to swiftly direct a foam ball towards the other team�s goal to score. Watch as the ball flies around the table keeping everyone involved. This exciting game is sure to be a hit at your next event. Hose Hockey accommodates 6 players. This inflatable game is not only fun but also will easily fit in most indoor and outdoor areas. Small children may need a step or a chair in order to reach the playing field. This game is suitable for all ages 5 and up. 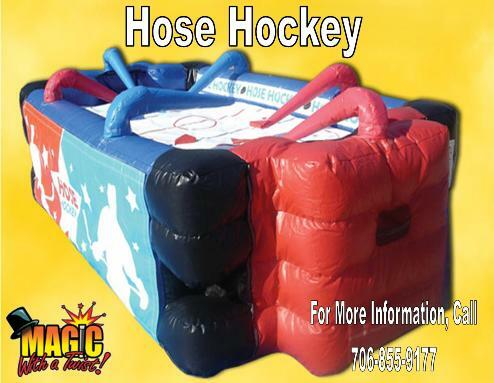 The Hose Hockey game requires a relatively flat area about 9� x 15' and within 100' of an electrical outlet. We prefer to set the inflatable up on grass. Please make sure all sticks, rocks and dog waste are cleared from the area before we arrive, to avoid delay in setting up for your event.